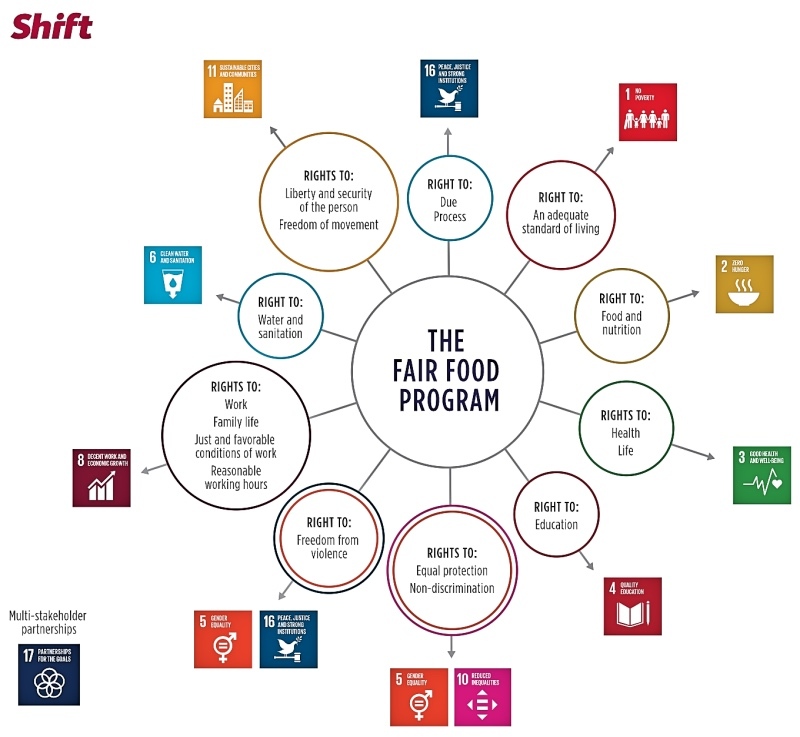 A diagram published by Shift, a non-profit organization based in New York City whose “mission is to put the [United Nations’] Guiding Principles into practice in order to support greater respect for the human rights of all people affected by business,” connects the Fair Food Program to ten of the UN’s Sustainable Development Goals. The Fair Food Program continues to accumulate accolades for its unparalleled success in protecting workers’ human rights in corporate supply chains. In recent weeks, two leading international voices on business and human rights made their admiration for the Fair Food Program known in articles dedicated to spotlighting programs “showing great promise” in fighting sexual violence and modern-day slavery. 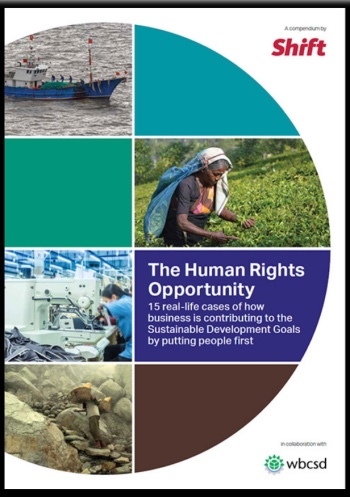 “The Human Rights Opportunity” offers 15 practical examples of how companies and multi-stakeholder initiatives are aiming to address human rights impacts and, at the same time, are showing great promise in delivering significant contributions to the Sustainable Development Goals (SDGs). Through this report, we seek to provide inspiration for how companies can harness innovation, leadership, influence and partnerships to tackle negative impacts in ways that maximize positive outcomes for people, in line with the SDGs. The #MeToo and Time’s Up movements continue to make headlines around the world every day. As these and other campaign efforts have made clear over many decades, some level of gender discrimination, sexual harassment, abuse and/or violence in the workplace is pervasive across industries and geographies. The agriculture sector in the United States is no exception. In fact, women farmworkers face some of the worst gender inequality conditions in the country – it is estimated that 80% of farmworkers who are women are sexually harassed or assaulted in the course of their work. On farms and in fields across the country, women farmworkers are often verbally or physically abused by supervisors or managers, frequently under threat of losing their jobs or the ability to work in the United States if they resist or report being raped, groped, grabbed, harassed, demeaned, discriminated against, or exposed to other such behaviors. The Coalition of Immokalee Workers (CIW), built on a foundation of farmworker community organizing in Florida since 1993, established the Fair Food Program (FFP) in 2011. CIW, farmworkers on participating farms, farmers and retail food companies implement the FFP. The Fair Food Standards Council (FFSC) is the program’s independent monitoring body and the only dedicated third party oversight organization of its kind for agriculture in the United States. The FFP “harnesses the power of consumer demand to give farmworkers a voice in the decisions that affect their lives, and to eliminate the longstanding abuses that have plagued agriculture for generations,” including sexual harassment, violence, discrimination and abuse. The Human Rights Opportunity goes on to outline the FFP’s key mechanisms for monitoring and enforcement, and is an excellent read, not just for its focus on the Fair Food Program, but for its wider look at effective social responsibility efforts across the globe. Meanwhile, the UK’s first Independent Anti-Slavery Commissioner, Kevin Hyland OBE, published his own opinion piece highlighting the work of the Fair Food Program last month for the British Academy, the “UK’s national body for the humanities and social sciences,” titled “Tackling modern slavery in global supply chains”. As the UK’s first Independent Anti-Slavery Commissioner, I have spent the past three years working hard to ensure our country plays its part in eradicating modern slavery and human trafficking. I am proud to have been a driving force in ensuring the Sustainable Development Goals (SDGs) include this issue, winning the support of the Pope for SDG 8.7 which aims to“eradicate forced labour, end modern slavery and human trafficking and secure the prohibition and elimination of the worst forms of child labour”. … And while we wait for governments to act, businesses can ensure workers are able to protect themselves in the meantime. This means supporting worker-led organisations, such as trade unions, within business operations and supply chains. Of course, unions and business do not always see eye-to-eye but this does not have to be the case: worker-led organisations can be viewed as a partner in the fight against slavery and can actually take pressure off business. The Florida Fair Food Program provides an example of this: described by the Harvard Business Review as among the ‘most important social impact success stories of the past century’, the programme has been designed by the tomato-pickers themselves. After years of endemic exploitation, including slavery, sexual harassment and health and safety issues, the tomato-pickers created a ‘code of conduct’. Through peer-to-peer education, they ensure all workers know the details of the code and can report grievances to a 24-hour hotline. Global brands, such as Walmart, Burger King and McDonald’s have signed up to the programme, buying Florida tomatoes only from growers within it. This is a win-win approach: the workers are protected and the brands can be assured of the ethics of this part of their supply chain. This model, called ‘Worker-Driven Social Responsibility’, is rightly gaining much attention from many sectors. Once again, the Fair Food Program is recognized for its unequaled effectiveness in leveraging the power of the market to monitor and enforce fundamental human rights. And once again, a leader in the world of business and human rights makes the case for the FFP’s expansion, not just in agriculture, but in diverse sectors of the global marketplace. The latest wave of recognition begs the question, a question that fueled last month’s huge march on Nelson Peltz’s hedge fund offices in Manhattan: How much longer, Wendy’s? Only, after reading these latest two pieces, the question is best posed not exclusively to Wendy’s, but to all the major food corporations – from Publix to Kroger, Costco, and Food Lion, just to name a few – that continue to drag their feet on adopting real human rights protections in their supply chains. Check back soon for more from the Fair Food front, as workers from Immokalee and allies from around the country take the fight to Wendy’s, Publix, and other key Fair Food holdouts! Women’s rights legend Gloria Steinem calls out Wendy’s for failing to support farmworker women! New popular education drawings make their debut at worker-to-worker education sessions on Fair Food farms along the East Coast!